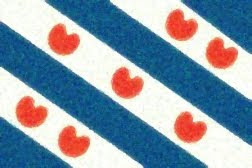 Fun With Frisian: NIJJIER - "New Year"
With 2014 on the way, let's look at how to wish someone a Happy New Year in Frisian. As with English, the word nijjier is formed from the word for "new," nij, and the word for "year," jier. Nij rhymes with the word "nigh" or "why." NIGH. Jier sounds very much like the English word "year." YEE-uhr. When said together with jier, the vowel in nij might sound like an "ee." Lokkich means "happy," "lucky," or "properous." It takes a long "oh" vowel as in the word "low" and a schwa in the second syllable. LOHk-uhg. Segen yn 't nije jier! Successes in the New Year! Sege means "victory," "triumph," or "success." Say it with an "eh" as in "bet" in the first syllable and a schwa in the second. SEH-guh. Remember that yn 't is short for yn it, "in the." Both of these words take a schwa. The shortened form takes one schwa. UHnt. Nije has a schwa on the end in this phrase. NIGH-uh.